We’d love your help. Let us know what’s wrong with this preview of Big Weed by Christian Hageseth. Marijuana legalization is the hottest story in the US today. 22 states have authorized sales in some form; Denver has more legal marijuana dispensaries than Starbucks franchises. We are witnessing the dawn of a new industry. And like the early days of gourmet coffee chains, the rules and players are being established on the fly. Christian Hageseth is the face of the revolut Marijuana legalization is the hottest story in the US today. 22 states have authorized sales in some form; Denver has more legal marijuana dispensaries than Starbucks franchises. We are witnessing the dawn of a new industry. And like the early days of gourmet coffee chains, the rules and players are being established on the fly. To ask other readers questions about Big Weed, please sign up. My toking days are long behind me, but I have always been a huge supporter of not only medicinal marijuana legalization, but also on a recreational level as well. When Colorado voters cleared the path for recreational use in 2014, it was a landmark moment in our country's history - a moment that millions longed to see. Christian Hageseth was at the forefront of this waging battle, running his marijuana dispensary Green Man and BIG WEED is the story of how all of this came to be and the hurdles that still need to be leapt over to legalize weed in the entire country. Chris is a businessman that lead a couple of different businesses to success before losing it all on his last venture which in turn, lead him to jump bong first into the medical marijuana business in 2009 to partake in what has came to be known as a Ganjapreneur. He describes in great detail all of the obstacles, hardships, failures, successes and joys along the way. His Green Man business started in 2009 as a two person team; himself and a grower, and in 2015 has grown into a multi-million dollar company with several employees and two Cannabis Cup awards under their belt: the highest honor in the industry! Interesting, and self-promotional, and either naive or arrogant in one spot. Hageseth, through his personal tour of his move from failed/overexposed real estate commodities speculator to self-described "ganjapreneur," gives a decent overview of the business of legal marijuana in Colorado. He gives even more of an overview of himself as an entrepreneur. Read the book and listen to the man sell *his ideas* for marijuana, etc. I probably could have done without some of the new agey type references, es Interesting, and self-promotional, and either naive or arrogant in one spot. I probably could have done without some of the new agey type references, especially in the last few pages. He talks about Ben & Jerry's, and people's loyalty to its particular flavors, not just B&J. And, makes two huge mistakes, whether more from naivete or from distortion, I don't know. First, Ben & Jerry's hasn't been some small hometown outfit for decades. It's part of Unilever, for doorknob's sake. Green Man was actually the first dispensary I ever visited on a trip to Colorado last summer. I wasn't impressed with them simply because of whoever was budtending that day. Now that I've read this book, I want to give them another chance. This book is all about Christian's journey to opening Green Man. As a future ganjapreneur myself, I found his story inspiring. He talks about how he got into the industry and how he dealt with the naysayers. He also offers advice to future industry newcomers. Green Man was actually the first dispensary I ever visited on a trip to Colorado last summer. I wasn't impressed with them simply because of whoever was budtending that day. Now that I've read this book, I want to give them another chance. As my team and I enter the Cannabis industry it is nice to find like-minded people who have forged the road ahead of us. As well as having the same thoughts and plan, we've made some of the same mistakes. This book is a must-read for anyone in the industry. While browsing the library, I came upon this book, and being a drug policy activist who is unfamiliar with the business side of marijuana (other than, ya know, being the customer at 502 stores in WA), I decided to give this a read. To be honest, I'm not sure what I was expecting. It was different from what I saw on the cover, and after I read through the book, I think I figured out what was going on. Technically, what's talked about on the cover is explored in the writing. I think what made the c While browsing the library, I came upon this book, and being a drug policy activist who is unfamiliar with the business side of marijuana (other than, ya know, being the customer at 502 stores in WA), I decided to give this a read. To be honest, I'm not sure what I was expecting. It was different from what I saw on the cover, and after I read through the book, I think I figured out what was going on. Technically, what's talked about on the cover is explored in the writing. I think what made the cover feel so different from the actual story is that the cover feels very impersonal, while the narrative is not - it's a personal story about Christian Hageseth's passion for his marijuana business, and why he believes that he and other venture capitalists can make the world better by expanding this field. Looking over some reviews, it seems like some readers are turned off by what they call the author's "self-promotion". To be honest, I'm not sure how such a story could be told without self-promotion. For me, this works well for the book. He's not writing a business primer for the marijuana industry, but rather his own experiences and why he believes such innovation is important for the world. His voice is crystal clear. And ah! it's so refreshing to read about someone in the industry who doesn't talk about bringing down capitalism in order to end the drug war. As someone who is also simultaneously interested in business and philanthropy, I really liked his perspective on the industry and legalization movements. His passion for positively changing the world shows even more when he writes about the boy in Mexico who walked to the US on foot to sell marijuana to support his family, and other instances of individuals taking initiative, or his seething at governments punishing those for harmless actions. Personally, I thought the beginning was slow, but it picked up once he started the business. By then, I didn't want to put the book down. I think the book's weak points are its organization and conglomeration of different stories. I think some of it could have instead been written into other books, or perhaps even a blog series. As for what I wish he could have written more about would be capitalism's role in refining the landscape for legal marijuana. He talks about the inevitability of Big Weed (like Bi Pharma or Big Agro), but doesn't expand much on it. With the title of the book, you would think it would go more into that. I would especially recommend this book for entrepreneurs and investors, no matter what you believe about marijuana. Would the anti-capitalist drug policy activist enjoy this book? I have no idea. Mildly interesting account of the early years of marijuana legalization in Colorado. The most interesting stuff to me was how, despite the business of selling medical marijuana being legal in Colorado, the author could not find a bank to manage his money. They were afraid to get involved because they were all national banks and marijuana was still legal at the federal level. So he was forced to operate a multi-million dollar business using cash only. That is just crazy. A well written book telling the story of a true pioneer in the industry; one who's intention is strong as his will to succeed. It's fun, illuminating and inspiring for those dipping their toes into the industry. A very good intro for the legal marijuana industry. It categorizes weed in a similar way that wine is; and after reading I feel like it's appropriate to say marijuana is to potheads as wine is to drunks. "Businesspeople like to brag that they're all about taking risks. But so much of their time is spent minimizing risk. Say that young people followed the musts upon graduation. In six years' time, where would they be?" Great story of a marijuana entrepreneur. Highlights the risks and rewards of the marijuana industry from a business owners perspective. Brief introduction into medicinal properties and history. 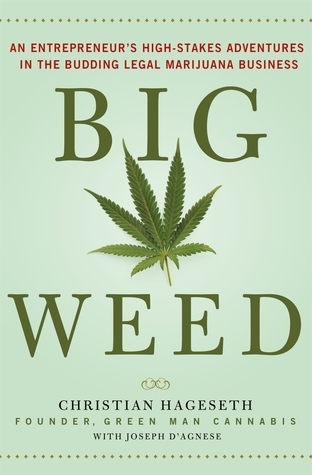 "Big Weed" is an enjoyable and educational book Hageseth is a marijuana enthusiast as well as a savvy businessman. In this book he presents his journey of creating a marijuana farm based on his knowledge of how our markets work. His background is in real estate but when that market crashed he needed to find another venture. 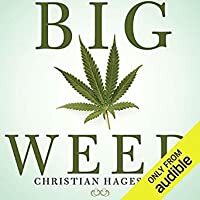 He discusses how his wife (now ex-wife) felt ambivalent about both his choice of the new Colorado laws surrounding this drug and his choice to continue as an entrepreneur rat "Big Weed" is an enjoyable and educational book Hageseth is a marijuana enthusiast as well as a savvy businessman. In this book he presents his journey of creating a marijuana farm based on his knowledge of how our markets work. His background is in real estate but when that market crashed he needed to find another venture. He discusses how his wife (now ex-wife) felt ambivalent about both his choice of the new Colorado laws surrounding this drug and his choice to continue as an entrepreneur rather than becoming an employee at an established firm. He also writes about how he presented his work to his three young kids. It was fun to trace his travails and sometimes his bumbling in this newly legal field. Hageseth's writing is clear and entertaining while still doling out his hard won wisdom of how businesses works. He found himself floundering at times because this is such a new field. After educating himself he also had to navigate the prejudices and just plain ignorance of the mainstream business world, law enforcement, and medical workers. If you've ever dreamed of striking out on your own "Big Weed" can serve in part as a `how to' business manual or if you've wondered about the types of marijuana and how they affect the body and mind you'll find it here. "Big Weed" is also entertaining. Big weed is the story of Christian Hageseth, a Colorado legal cannabis baron. The book chronicles the story of his companies (Green Man Cannabis) rise to the top of the legal marijuana business as well as his predictions on the possible futures legal weed will take. When I received an advance copy of this in the mail, I had my doubts about it. I'm a glass pipe maker by trade and life long cannabis devotee and so the industry (as well as its future) interests me to no end. The issue arises when on Big weed is the story of Christian Hageseth, a Colorado legal cannabis baron. The book chronicles the story of his companies (Green Man Cannabis) rise to the top of the legal marijuana business as well as his predictions on the possible futures legal weed will take. When I received an advance copy of this in the mail, I had my doubts about it. I'm a glass pipe maker by trade and life long cannabis devotee and so the industry (as well as its future) interests me to no end. The issue arises when one begins purchasing books on the subject, the industry is new and there is always money in the new, including books, and many people will try to exploit that with cheap, subpar work that selflessly promotes the author's cannabis company. Big Weed, while there is certainly a bit of self promotion, breaks that stereotype and Christian delivers a well written book that highlights his adventures in the pot trade. While that much of the book is entertaining (sometimes to the point of laughter), it's his predictions for the future of legal marijuana that I really enjoyed. His prediction of the bifurcation of the business into two groups sounds spot on to me. The book is an easy read and I breezed through it in two sittings. If the inner workings of the cannabis trade interest you, definitely check this book out. You won't be disappointed. I recieved this book as a Goodreads First Read. Big Weed is an exciting, fast tale of capitalist struggle and success. I was distracted by some tonal shifts--sometimes Hageseth talks business, sometimes he tells personal stories, sometimes he takes an activist tone. For example, did you know that marijuana was first outlawed to limit its usage by Mexican laborers, under the thought that it might cause them to act erratically and violently? Hageseth knows, and the fact is shocking. But several pag I recieved this book as a Goodreads First Read. Big Weed is an exciting, fast tale of capitalist struggle and success. I was distracted by some tonal shifts--sometimes Hageseth talks business, sometimes he tells personal stories, sometimes he takes an activist tone. For example, did you know that marijuana was first outlawed to limit its usage by Mexican laborers, under the thought that it might cause them to act erratically and violently? Hageseth knows, and the fact is shocking. But several pages after reading that fact, we're back into learning more about his early failures in his fledgling business. The book tries to be a little bit of everything to everybody: from marijuana neophytes to people who understand entrepreneurship to people who need convincing as to why legalization is important. It's a quick, easy read, and a solid overview of the marijuana industry so far. Engaging and informative overview of the incredible changes taking place in the world of marijuana cultivation, sales and legal issues with a particular emphasis on all things business related. Not so much a "how to" more of a "how did I". It's inspiring and entertaining largely because the author shares his personal journey and genuinely seems to have had quite the transformation. If he is to be believed and trusted then the future of craft, quality marijuana is in reasonably good hands as he a Engaging and informative overview of the incredible changes taking place in the world of marijuana cultivation, sales and legal issues with a particular emphasis on all things business related. Not so much a "how to" more of a "how did I". It's inspiring and entertaining largely because the author shares his personal journey and genuinely seems to have had quite the transformation. If he is to be believed and trusted then the future of craft, quality marijuana is in reasonably good hands as he appears to be strongly positioned to be the big 'green guy'. I live in Washington state, where we have legal recreational marijuana, and the town I live in has its first marijuana shop. I liked the idea of seeing what the business is like from the other side. I found this book informative and interesting. It flowed well and I learned about parts of the legal marijuana business that I didn’t know. The author obviously has a bias but I thought he did a good job of not preaching too much and trying to educat I received this book through Goodreads First Reads. Wow!!! I received this book from Good Reads First Reads Giveaway. I am so glad that I did. This book is absolutely amazing. What a wonderful and charismatic man. I live in Oregon where marijuana is currently legal for recreational use. I learned so much from this book. So educational but yet so exciting to read. What an inspiration this book has been. This man should be so proud but yet is so real. A must read for all types. As you read this book you feel as if you are walking through this exper Wow!!! I received this book from Good Reads First Reads Giveaway. I am so glad that I did. This book is absolutely amazing. What a wonderful and charismatic man. As you read this book you feel as if you are walking through this experiences with the author. Truly amazing and highly recommended. Loved it and I do not even smoke the stuff!! While there is nothing earth shattering here if you've been following legalization issues, Big Weed is a quick, entertaining read. There are some basic business ideas that could apply in any entrepreneurial enterprise. I would recommend this more for people who are simply curious and want a peek behind the curtain. For anyone seriously looking for resources to start a grow operation or other marijuana-related business, you'll want to look elsewhere. Author is proposing that the push to legalize marijuana will continue to evolve in the United States. Today, the public’s perception of marijuana culture is different than before; law enforcement too is grappling with new attitudes and newer laws. As marijuana becomes a serious and legal business opportunity, society may take a more accepting and constructive look at how to market and use the drug responsibly. A good starting point for understanding the changes Canada is facing as we move towards legalization of marijuana. I received this from a Goodreads giveaway. A very enjoyable book. Though I have lived here in CO all my life and voted yes to every Pot ballot issue, I no longer partake. I agree with the authors premise that the easing of Marijuana laws is a good thing for society. The biggest take for me is that the Cannabis Ranch is located a few miles from me and I can't wait to see what music artists will be performing. I won this novel in the First Reads giveaway! I love learning about the new hemp industry and legal marijuana's steps to being integrated into the average American life. Christian Hageseth is a huge name in the industry, I have heard many good and otherwise interesting things about this influential man and it was fun for me to find out his journey to success. I enjoyed this novel greatly. This is definitely worth the read. It is a very well written book. I thought it to be interesting to see a side of the marijuana business. Definitely an interesting read that I could see myself reading again in the future. It took about a day to read it. i found it hard to set the book down. Would recommend to anyone and everyone. I received this book as a first read. It was an interesting look at Colorado's transition to legalized marijuana use. It looked at the complexities involved with starting a weed business, banking, police, investors, family, public perception, etc. This would be a great read for people living in states that are considering legalization. I got this book as part of a giveaway. I recommend that everyone read this book, no matter what their view on marijuana. The book was very enlightening, informational, and it opened my mind. It was interesting to read about the progression of an entrepreneur and the book read like it was a long lost friend telling you their life story. Overall, it was an easy read and extremely eye opening.